We are dealing with a project that has an existing building, demo, and new construction requirements. There is a need to control the visibility of existing grids, grids that will be removed during the demo phase, and new grids. There are a major limitations to grids that everyone should be aware of. You cannot control the grids by phase; therefore you cannot demo a grid or use phase filters to show/not show specific grids. 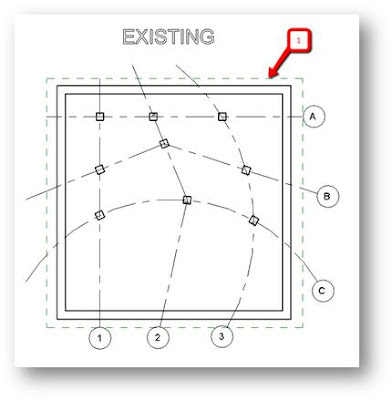 In a post by Steve Stafford from 2008 in the Augi Forums it was suggested that you can use worksets, design options, or Scope Boxes to control the visibility of grids. Thanks for highlighting this 5 years ago Steve! And this is still true today. If your project is not workset enabled you are down to two options, scope boxes and design options. I looked to explore this in greater detail. I found another limitation, that is related to a new “feature” in 2013. Grids that are created as multi segmented cannot be assigned to scope boxes (#FAIL). So if you have any grids that are multi segmented you will not be able to use scope boxes and your only options would be design options or worksets. So, how do you use scope boxes to control grids? In this example we start with an existing wall, a few columns and grids all on the existing phase. We then created a scope box. The next step is assign a scope box to each grid. Grids 1 and A will not be assigned a Scope Box. It will show as None. We do this so the those grids will always show up. We are not touching them. 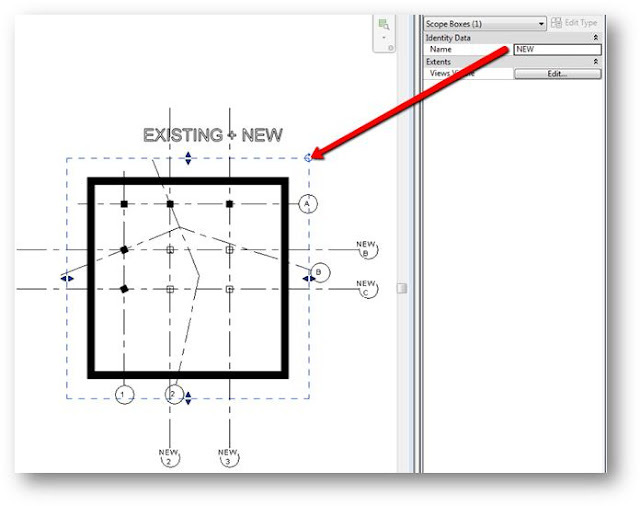 Grid 2 and B cannot be assigned since these are Multi-segmented Grids - ask Autodesk why? 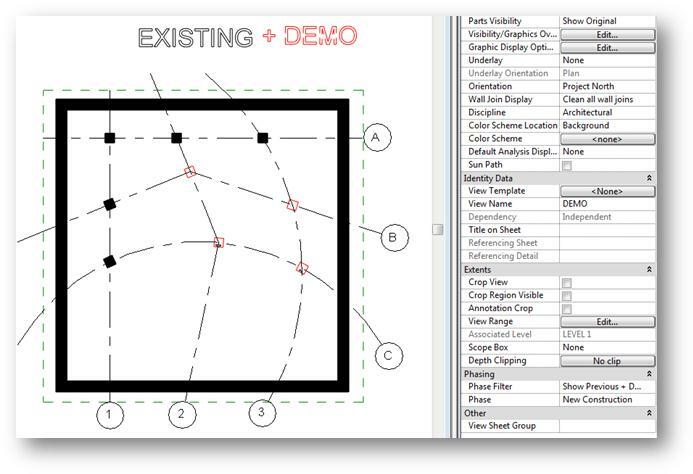 Grid 3 and C to be assigned to the DEMO scope box we created earlier. Now we can demo a few columns (I set the visibility overwrite to RED so you easily see what is being demolished) I also changed the Phase Filter to show the Previous Phase (Existing) and Demo. Now the new grids need to be added. I added NEW 2, NEW 3, NEW B, and NEW C. Created a new scope box called NEW. I then assigned these new grids to this new scope box. I also added a few columns to the new grid intersections. I quick feature to do this is select the All Grids feature first, then select the grids - the columns will drop at the intersections of the grids. Notice that you do not see two scope boxes in my views. 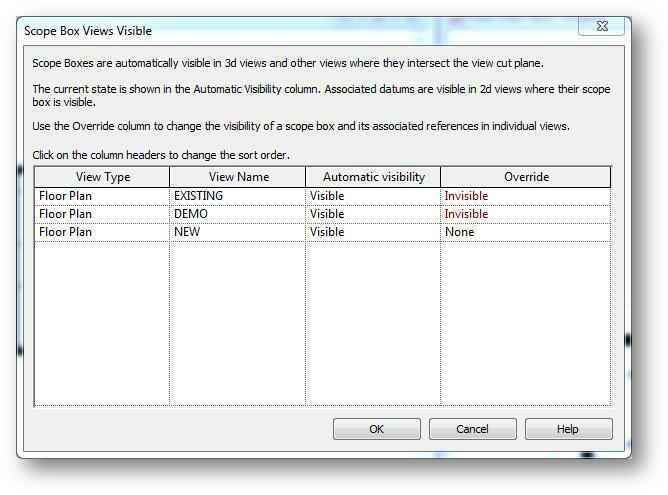 That is because these scope boxes have specific views set to show or hide based on the Views Visible Settings. When you have a scope box highlighted you can control the views via the Views Visible “Edit…” button. In this case I selected the NEW scope box and used the settings below – I do not want the NEW scope box or the grids related to it to show in the EXISTING or DEMO views. In conclusion, using scope boxes to control your grids is a great method, but until Autodesk change the ability to control multi segmented grids you might need another option like design options or worksets. If you would like to download this model to explore further, use this link. We have been using another method for getting around this grid phasing issue, which is also very effective (and simple). Then by creating 3 filters, on the grid category, filtered by type name. The filters are then applied to your view templates with the visability set to off. The view templates are of course also defined with phase filters. 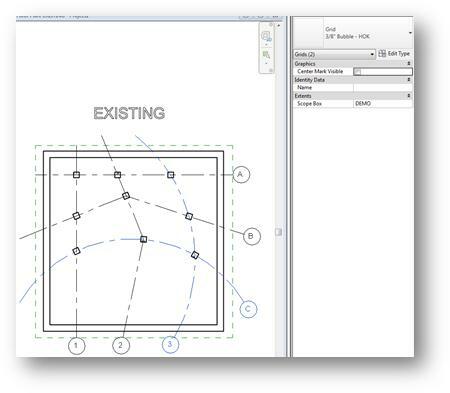 We always use view templates and phase filters for all of our sheet views in multi phased projects. You can of course also filter in working views via VG if needed. Thanks Dan and David for your comments. I like both your additional techniques and in both cases as with the one I shared the naming convention is key. In exploring published standards out, there does not seem to be a standard for how Grids should be named for these case senarios. I am interested to hear what standards people are using. 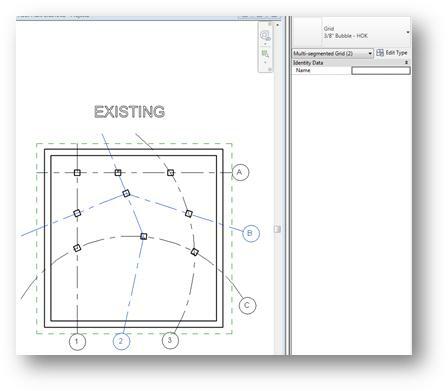 Another workaround would be to utilise a new feature that was added in Revit 2013 which gives you the ability to save any selection of elements that you have selected, and recall those selections at any point. So you could use View Filters by creating an Saved Selection Set by filtering out your different Phased Revit Grids and Levels and then apply them to an View Filter or a View Template by switching off the Visibility tick box in your Visibility/Graphic Overrides.